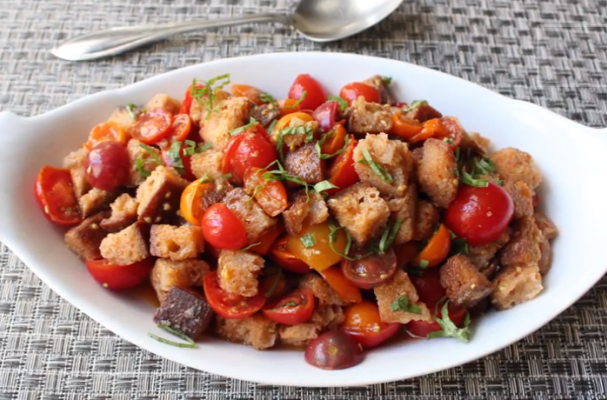 Panzanella salad, a classic Italian dish, was invented as a way to use up stale bread. This bread salad is made with fresh tomatoes, onions, olives, cucumbers, and whatever other vegetables you have on hand. The juice from the tomatoes and a healthy drizzle of olive oil is soaked up by the bread, softening the cubes. Depending on taste, the soggy bread cubes bursting with tomato flavor may be appealing or a turn off. For those of you who are part of the latter group, this recipe is for you. The bread cubes are fried in olives oil before they are tossed with the other salad ingredients. The crispy crusts acts a s a barrier so that the bread can be soft without being soggy. If you are watching your figure, you can also make a grilled version. Panzanella is the perfect way to use up the last of your summer tomatoes and other summer vegetables.